Horizontal axis crosses - Maximum axis value - When ticked the axis is positioned at the maximum value of the perpendicular axis. Display Units - if your numbers are large numbers then you will want to display the values in terms of a unit. Values in reverse order - this means the scale extends in the opposite direction. Smallest values at the top and largest values at the bottom. Minimum - Fixed - The number at which the axis starts. Maximum - Fixed - The number at which the axis ends. Major unit - Fixed - The size of the interval. The position for major gridlines. Minor unit - Fixed - The position for minor gridlines. Values in reverse order - This inverts the chart top to bottom. 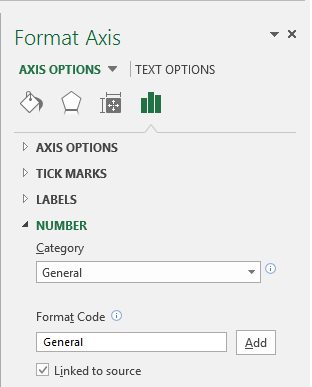 The category axis will also be changed from top to bottom. Display units - Divides the numbers by a specific multiple of 10. Useful when the numbers have a lot of decimal places. 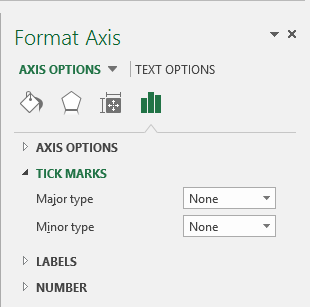 Show display units on chart - Adds the display unit label chart element alongside the axis. Major tick mark type - Location of the major tick marks. Minor tick mark type - Location of the minor tick marks. 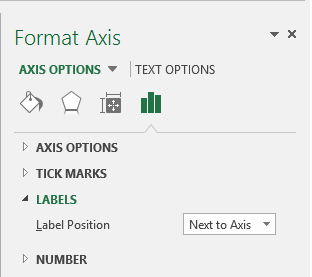 Axis Labels - Location of the axis labels. 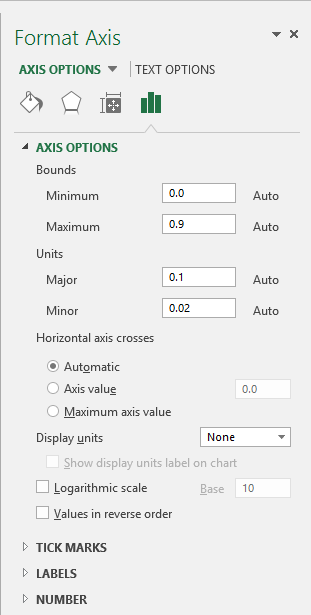 Horizontal axis crosses - automatic - Changes the intersection point of the axis. Horizontal axis crosses - axis value - Changes the intersection point of the axis. Horizontal axis crosses - maximum axis value - Changes the intersection point of the axis.